My man is a sensitive, tenderhearted man. He loves refined food and even enjoys baking Christmas cookies. But a man has to be a man. Tonight he looked at me and said, "Enough with the fish and veggies. I need meat and potatoes." So we made roasted pork tenderloin and simple roasted potatoes. And when I say simple, I mean simple. Olive oil, salt and pepper. That's it. We beth kept gushing about the potatoes. They tasted like a blend between popcorn and McDonald's french fries. 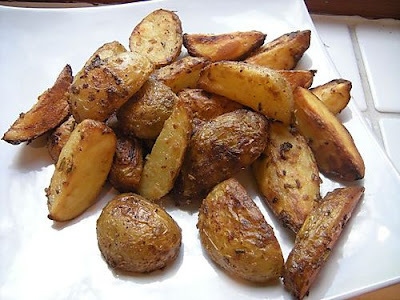 Take fingerling potatoes (as many as you want) and cut them in half. Spread evenly on cookie sheet. Drizzle generous amount of olive oil on top (you can't over do it.) Salt and pepper generously (you really can't over do this either.) Roast at 400 for 45 minutes, stirring once.